One of the things normally taken on a trip to Malaysia is a passport. On arrival at passport control in Woodlands, Mrs M discovered that she had left hers at home which necessitated lengthy discussions with officials before we were allowed to drive back into Singapore. Oozing stress, Mrs M glanced at the satnav’s clock every couple of minutes as we drove home to fetch the required document and head back to Woodlands. There was now three hours to get to the 3.00pm ferry in Mersing; still sufficient time. After clearing passport control for a second time, we pulled into a queue of cars which stretched over the causeway to the Malaysian checkpoint. Forty-five minutes of clock-watching later, we were on the Johor Bahru Expressway with two-and-quarter hours to complete the two-and-a-half hour journey. Route 3 was unusually quiet allowing the occasional burst of hastiness. We arrived half an hour before departure. We had made it……or so we thought. As I parked the car, Mrs M walked to the ticket office where the Tioman ferry was pulling away from the jetty. The staff tried to call the boat, but it was unable to return due to the low tide. ‘Bother,’ I thought (or something along those lines). Mrs M flapped. We phoned the resort on Tioman to explain what had happened and arranged collection from tomorrow’s 10.00am ferry. In need of a place to stay for the night, we drove south to the Teluk Iskandar Inn where we have stayed in the past. Unfortunately, the hotel had been closed for a few weeks as the owner was unwell. The owner’s wife gave us the name of another hotel in the paddy fields north of Mersing and some vague directions. After driving for about 10km past Mersing along the coast, we found signs for the hotel, but the turning lead to a garishly painted school. 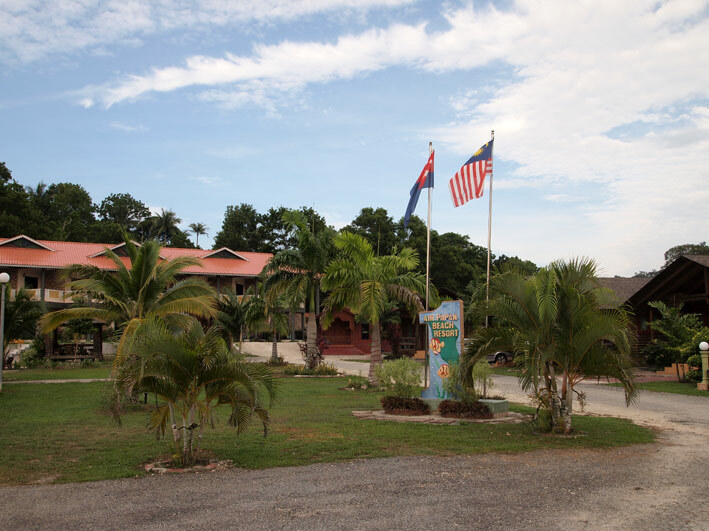 However, we were close to the Air Papan Beach Resort and decided to accept the ‘any port in a storm’ option. The air conditioning unit in the room eventually brought the temperature down to a level fit for human habitation which was the one aspect that could have sent Mrs M over the top. The bed had clean cotton sheets, but I would have thought for 180 Ringgits (without food) we could have been given a top sheet to go under the matted, unlaundered covering that looked like the material from a 12th century monk’s robe. Some toilet paper would have been a nice touch as well. It probably won't go on 'Mrs M Tours' recommended places to stay list. Just before sunset, we drove to Mersing in search of the Loke Tien Yuen Chinese restaurant we discovered a couple of years ago. The owner was very apologetic, but all of the tables had been reserved for Mother’s Day parties. It was not our day. We found another Chinese restaurant where we had plenty of time to reflect on the day’s events due to the leisurely pace of service. It wasn’t all bad news as I managed to fill the car with 95 RON petrol (normally not allowed for foreign cars) using a credit card which cost 99.90 Ringgits, about half the price in Singapore.